Recently I’ve been reading a fab little book by one of my blogging friends. It’s called ‘The Butcher and the Vegetarian’. It chronicles my friend’s journey from vegetarian to occasional meat eater for health reasons. And it’s a great read. Tara talks about growing up, when her mother was all about making everything as healthy as possible. They often ate steamed veg with brown rice and NO oil or salt. Not exactly tasty. 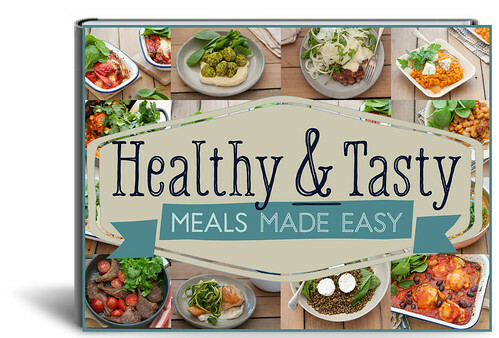 It made me a little sad because I think there is often a misconception that healthy food can’t be pleasurable. The thing is, if you eat broccoli and actually enjoy it, you get the same health benefits as if you ate it like it were a badge of honour. So today I wanted to share my favourite tricks for making veg taste amazing… Because aren’t we all more likely to eat more veg if we actually enjoy them? Many vegetables contain a lot of bitter flavours. And while a love of bitterness can be acquired, there is something you can do to mask it. Yes, our old friend salt. Really it makes a HUGE difference. Don’t be worried about the negative health connotations associated with salt. That’s for when you’re eating industrial-sized quantities, not the small amount of sea salt that it takes to mask the bitterness in your broccoli. Salt is also great because it enhances flavours. Fat carries flavour and provides fat soluble vitamins which tend to be lacking in veg. So it’s actually better for you to use olive oil, avocado oil, coconut oil or even butter when cooking veg. One of the easiest ways to make veg taste yuck is to boil the hell out of them. Boiling is also problematic because your water soluble vitamins end up down the sink. These days, the only veg I boil are broad beans, edamame and spuds for roasting or when I’m making mash. I love roast veg but they can take a while, so I often pop them in a frying pan for a speedier alternative. Unlike boiling, these dry heat methods of cooking help add yummy caramelized flavours to your veg and remove excess moisture. Which is why they’re so delicious! When I was little I hated peas. Boiled frozen peas were all I knew. And then one day when I was older I had a life-changing spring vegetable soup at a little restaurant called the Lynwood Cafe which had its own vegetable garden. I couldn’t believe that I not only liked the freshly picked sweet peas, I loved them. Now I’m not saying there’s anything wrong with frozen peas. They’re a brilliant vegetable to have on hand. I tell the story as a reminder that all veg are not equal when it comes to flavour. The carrot you get from the supermarket generally never holds a candle to one you grow yourself. I’m a big fan of using tasty accompaniments to make my veg more palatable. Here are some of my favourites: chilli, soy sauce, parmesan, miso paste, olives, peppery extra virgin olive oil, pesto, fresh herbs, spices and hummus. Roasting cauliflower is the easiest way to turn it into a super tasty treat. 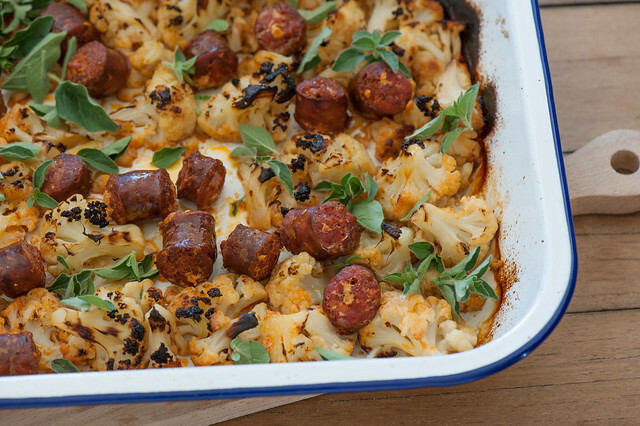 I love how the pale colour of cauli makes the chorizo pop. The cauli also packs a nutritional punch just as weighty as broccoli and its other brassica cousins. I’ve used oregano in the picture because I was out of parsley and the oregano in my garden needs eating up. 1. Preheat your oven to 250C (475F). 2. Chop cauli into bite sized little ‘trees’. Place on a baking tray and drizzle with a little oil and a splash of water. Cover with foil and cook for 20 minutes. 3. 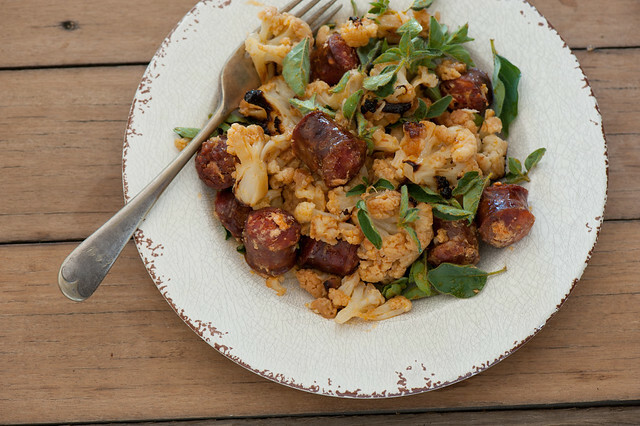 Remove foil and scatter chorizo over the cauli. Season with salt. Return to the oven uncovered for 20-30 minutes, stirring once or twice until the chorizo is cooked and the cauli is soft in the middle and browned. 4. Combine vinegar with 1-2 tablespoons extra virgin olive oil in a small bowl. Season. 5. When the cauli is cooked, toss the dressing in. Taste and adjust seasoning if needed. 6. Divide between 2 plates and serve with herbs and nuts on top. vegetarian – Skip the chorizo. Add a pinch of smoked paprika to the dressing. Serve cauli, herbs and nuts with a poached or fried egg or a dollop of cooling ricotta. vegan – replace chorizo with a drained can of chickpeas. Add a pinch of smoked paprika to the dressing. more substantial – serve with pita bread, steamed brown rice, hummus or cooked quinoa. Tossing in chunks of sourdough at the end so it soaks up the chorizo oil can also be really lovely. nut-free – replace the nuts with extra chorizo. Or serve with toasted breadcrumbs instead. different meat – any sausage can be used here. Or try finely sliced strips of chicken thigh. * Thanks to the lovely Darya Rose for the title inspiration. And for those of you not familiar with ‘potato chips’ they’re the Australian version of ‘French Fries’. ps. Have you seen my latest eCookbook? pps. I’ve had some really lovely feedback on the book already. I am so excited about this eCookbook, congratulations! I purchased it almost instantly as I knew you would not disappoint me… and indeed, even after only a quick glance through it, this is again a success. I love how you always find ways to make tasty food in all its simplicity! Even with a busy schedule, I’m always eager to try one of your recipes… Can’t wait to try one of these! Eve, ‘Healthy & Tasty’ Owner. Great points, and another is to change up the shape of your veggies: Chopping, mincing, shredding (chiffonade), jullienne, spiralized (great too1) – – and don’t forget “zucchini/squash tagliatelle” made using a simple potato peeler. Just like pasta, different shapes can maximize flavor. Whatever the shape, try to keep it all uniform for even cooking, and have fun! Funny your comment about peas. Frozen peas are OK, canned peas are horrible, but I never knew what peas were really supposed to taste like until we planted them in our own garden Awesome! No wonder so many people don’t like them, they’ve never really eaten them. Oh how I miss my garden! P.S. If you add frozen peas to ANY recipe do so at the last minute – just long enough to thaw them out. Otherwise you will end up with that mush you don’t like. But I find even with minimal cooking I struggle… it’s definitely more about me than the peas! Nice tips!! I love vegetables! I don’t like potato chips so I love roasted veggies. Not like potato chips? That would be sacrilege in our house Arthur! It isn’t necessarily true that the fat-soluble vitamins are lacking in vegetables (depending on which veg you’re talking about), but a little fat in the meal is important in order to be able to absorb the vitamins from the veg. So yes, we should go ahead and have a little oil or butter with the veg, but for a slightly different reason. Thanks for pointing out that the oil helps with absorption Elene. I am planning on making a book/ebook on how to make vegetables taste better and would like your permission to apply your tips to the book. Please reply. Also there will be a bibliography with your name and website or book if you would allow me to use your tips. I was worrying to my sons Pediatrician that he doesn’t eat enough veggies and his advice was the same as you …. veggies can taste yuck … they need butter and oil!